Breeding season markings: Look for the Common Loon’s “tuxedo” markings and the Red-breasted Merganser’s bright orange bill and shaggy crest. Shape: Loons tend to be bulky and sit very low on the water, and Common Loons are the largest of the loons in North America. Mergansers are thinner long birds, and sit higher in the water so you can see their tails. 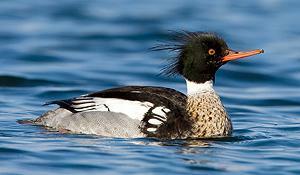 Bill: Loons have a thick, dagger-like bill; mergansers sport a thin, longer bill which in some species is bright orange. 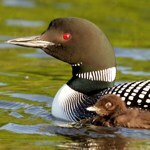 Call: The Common Loon has an unmistakable and other-worldly call; the merganser call is more duck-like.